the virtual functions here all return 0, since no area determination is implemented. Definition at line 48 of file ClusterSequenceAreaBase.hh. return the area associated with the given jet; this base class returns 0. Reimplemented in fastjet::ClusterSequenceActiveAreaExplicitGhosts, fastjet::ClusterSequenceArea, fastjet::ClusterSequenceActiveArea, and fastjet::ClusterSequenceVoronoiArea. Definition at line 70 of file ClusterSequenceAreaBase.hh. return the error (uncertainty) associated with the determination of the area of this jet; this base class returns 0. Reimplemented in fastjet::ClusterSequenceArea, fastjet::ClusterSequenceVoronoiArea, and fastjet::ClusterSequenceActiveArea. Definition at line 74 of file ClusterSequenceAreaBase.hh. where PseudoJet("rap,phi,pt=one") is a 4-vector with the given rapidity (rap), azimuth (phi) and pt=1, while Theta("rap,phi inside jet boundary") is a function that is 1 when rap,phi define a direction inside the jet boundary and 0 otherwise. This base class returns a null 4-vector. Definition at line 87 of file ClusterSequenceAreaBase.hh. NB: most area classes do not give any explicit ghost jets, but some do, and they should replace this function with their own version. Reimplemented in fastjet::ClusterSequenceArea, and fastjet::ClusterSequenceActiveAreaExplicitGhosts. Definition at line 95 of file ClusterSequenceAreaBase.hh. Derived classes that do include explicit ghosts should provide an alternative version of this routine and set it properly. Definition at line 104 of file ClusterSequenceAreaBase.hh. return the total area, corresponding to the given Selector, that is free of jets, in general based on the inclusive jets. return the total area, within the selector's range, that is free of jets. 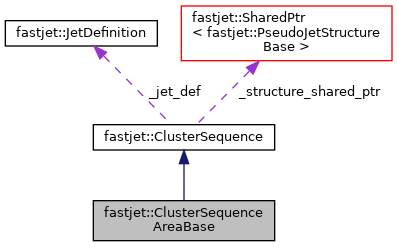 Reimplemented in fastjet::ClusterSequenceActiveAreaExplicitGhosts, fastjet::ClusterSequenceActiveArea, fastjet::ClusterSequenceArea, and fastjet::ClusterSequencePassiveArea. Definition at line 57 of file ClusterSequenceAreaBase.cc. return the total area, within range, that is free of jets. Definition at line 69 of file ClusterSequenceAreaBase.cc. return something similar to the number of pure ghost jets in the given selector's range in an active area case. For the local implementation we return empty_area/(0.55 pi R^2), based on measured properties of ghost jets with kt and cam (cf arXiv:0802.1188). Note that the number returned is a double. Reimplemented in fastjet::ClusterSequenceArea, fastjet::ClusterSequenceActiveArea, and fastjet::ClusterSequence1GhostPassiveArea. Definition at line 136 of file ClusterSequenceAreaBase.hh. Definition at line 86 of file ClusterSequenceAreaBase.cc. Definition at line 102 of file ClusterSequenceAreaBase.cc. Definition at line 118 of file ClusterSequenceAreaBase.cc. using jets withing the selector range (and with 4-vector areas if use_area_4vector), calculate the median pt/area, as well as an "error" (uncertainty), which is defined as the 1-sigma half-width of the distribution of pt/A, obtained by looking for the point below which we have (1-0.6827)/2 of the jets (including empty jets). where the error is only that associated with the fluctuations in the noise and not that associated with the noise having caused changes in the hard-particle content of the jet. NB: subtraction may also be done with 4-vector area of course, and this is recommended for jets with larger values of R, as long as rho has also been determined with a 4-vector area; using a scalar area causes one to neglect terms of relative order $R^2/8$ in the jet $p_t$. Definition at line 200 of file ClusterSequenceAreaBase.cc. a more advanced version of get_median_rho_and_sigma, which allows one to use any "view" of the event containing all jets (so that, e.g. one might use Cam on a different resolution scale without have to rerun the algorithm). Note that for small effective radii, this can cause problems because the harder jets get an area >> <ghost-jet-area> and so the estimate comes out all wrong. In these situations it is highly advisable to use an area with explicit ghosts, since then the "empty" jets are actually visible. Definition at line 230 of file ClusterSequenceAreaBase.hh. fits a form pt_per_unit_area(y) = a + b*y^2 in the selector range. fits a form pt_per_unit_area(y) = a + b*y^2 for jets in range. exclude_above allows one to exclude large values of pt/area from fit. (if negative, the cut is discarded) use_area_4vector = true uses the 4vector areas. exclude_above allows one to exclude large values of pt/area from fit. use_area_4vector = true uses the 4vector areas. Definition at line 138 of file ClusterSequenceAreaBase.cc. return a vector of all subtracted jets, using area_4vector, given rho. Definition at line 344 of file ClusterSequenceAreaBase.cc. return a vector of subtracted jets, using area_4vector. Definition at line 366 of file ClusterSequenceAreaBase.cc. return a subtracted jet, using area_4vector; note that this is potentially inefficient if repeatedly used for many different jets, because rho will be recalculated each time around. Definition at line 404 of file ClusterSequenceAreaBase.cc. return the subtracted pt; note that this is potentially inefficient if repeatedly used for many different jets, because rho will be recalculated each time around. Definition at line 439 of file ClusterSequenceAreaBase.cc.